Dėmesio pakrovėjas į komplektą neįeina!!! Enjoy all your favourite 3DS games on the big screen with the new Nintendo 3DS XL console. The Nintendo 3DS XL's screen is 90% larger than the Nintendo 3DS, making it the biggest screen on any Nintendo handheld console. With so many great games available, you be pleased to know the Nintendo 3DS XL boasts a better battery life so you can play for even longer. • Rediscover your games with the larger screen - soar through even more epic landscapes in Kid Icarus: Uprising, or prepare for bigger frights in Resident Evil: Revelations. • Improved 3D and sweet spot to bring game worlds, enemies and heroes to life. • Longer battery life for longer exploration, racing multiplayer battling, and online gaming. Measuring at 4.88 inches, the Nintendo 3DS XL's 3D screen is the biggest screen ever featured on a Nintendo handheld console. 90% larger than the screens found on the Nintendo 3DS system, users will be amazed as the large screen delivers amazing 3D graphics without the use of glasses. Perfect for revisiting old favourites or starting new adventures, Nintendo fans can expect a more engrossing experience in all their games. Fans of the Art Academy series will benefit especially; by taking advantage of the larger screens to make more precise brush strokes, players can get the feel of painting on a real canvas and take pride in displaying their works at the largest possible dimensions. The largest ever screen, enhances the impression of depth and creates the most immersive 3D experience possible. Players will see the Mushroom Kingdom brought to life on the 3DS XL and discover the beauty of Super Mario 3D Land as never before. No detail will be missed when players join Mario as he explores the brilliantly designed levels in his latest adventure to save Peach from Bowser. Despite the increase in screen size, the Nintendo 3DS XL console boasts a better battery life than the Nintendo 3DS. The Nintendo 3DS XL has an impressive battery life of up to 6.5 hours when running 3DS software and up to 10 hours with DS software. Gamers will be able to take their Nintendo 3DS XL console on the move, safe in the knowledge that it won't run out of valuable playing power. This means that avid Kid Icarus: Uprising players can engage in longer multiplayer battles - and more of them. The AC adapter is not included with the console, but the Nintendo 3DS XL is compatible with all previous 3DS, DSi and DSi XL power cables. Take Miis everywhere and quickly transfer Miis and game data between devices. Using a WiFi connection, users can take advantage of the Wii's Mii Channel and the 3DS XL's Mii Maker to send Miis directly from one console to another. Keep all game and StreetPass data as well as photos and Ambassador status when upgrading. By connecting the 3DS XL and a DSi or 3DS to the internet, the 3DS XL's System Transfer functionality can be used to easily move some or all data to the new console. 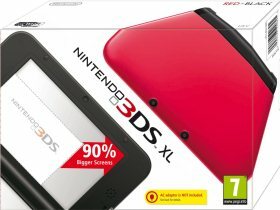 Packshot of the Nintendo 3DS XL. Like previous handhelds released by Nintendo, the Nintendo 3DS XL incorporates both an upper and lower LCD display in a clamshell layout. The lower screen features familiar Nintendo touchscreen technology, is 4.18" with 320 x 240 pixel resolution and is capable of displaying 16.77 million colors, but the groundbreaking upper 3D screen of the Nintendo 3DS XL system is where Nintendo opens up a whole new world of eye-popping gameplay possibilities. This 4.88" display is capable of displaying approximately the same 16.77 million colors, but with 800 x 240 pixel resolution. 400 pixels are allocated to each eye to enable 3D viewing. This stereoscopic 3D display gives objects within the gameworld a feeling of space and depth that extends far into the back of the screen. This amazing depth of field effect vastly increases the ability to see the position of characters and obstacles in compatible game, making many game experiences even more intuitive for all types of players. A built-in 3D Depth Slider along the right side of the top display allows you to immediately adjust the intensity of the 3D settings on the Nintendo 3DS XL system to your liking. The 3D effect can also be turned down completely if the player so chooses. All Nintendo 3DS XL games and applications can be played in 2D, and look better when played on the Nintendo 3DS XL than any Nintendo handheld before it. Portable play control reaches a new level with the Nintendo 3DS XL's Motion Sensor and Gyro Sensor combination. Together these precision built-in features allow for new and unique gameplay mechanics as the 3DS XL reacts to real-time motion and tilt. Whether players are twisting their systems side to side, or moving it up and down, their motion-compatible Nintendo 3DS XL games respond instantly. 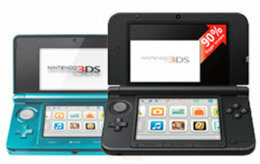 With the Circle Pad, located above the + Control Pad, Nintendo 3DS XL offers full analogue control in 3D game worlds. Combined with the touch screen, traditional buttons, camera and microphone input, and advanced motion control of the Motion Sensor and Gyro Sensor, the potential is extraordinary. Along with a digital camera facing inwards towards the player, the Nintendo 3DS XL system features two outer cameras positioned along its upper edge when device is open. These two cameras see the world in 3D, much like the human eye, allowing for the creation of 3D photos - and a similar 3D effect to that seen in Nintendo 3DS games. All cameras feature 640 x 480 resolutions with single focus lenses that use the CMOS capture element and an active pixel count is approximately 300,000 pixels. Nintendo 3DS XL brings fellow players together in exciting new ways with StreetPass communication. Set your Nintendo 3DS XL to Sleep Mode and carry it with you wherever you go to exchange game data like Mii characters, high scores, and custom characters with other users you pass on the street. You control what data you exchange and you can exchange data for multiple games at once, making virtual connections with real world people you encounter in your daily life. Nintendo 3DS includes SpotPass, a feature that lets Nintendo 3DS detect wireless hotspots or wireless LAN access points and obtain information, game data, free software, videos and so on for players even when the system is in sleep mode. Every Nintendo 3DS XL system comes packed with a 4 GB SD memory card. You can use this SD memory card to store your 3D photos, and sound recordings created on the Nintendo 3DS system, and music from your PC. You can also use it to store games downloaded from the Nintendo eShop. The Nintendo 3DS system has SDHC card compatibility to increase your storage space even further. Almost all existing Nintendo DS and Nintendo DSi games can be played on a Nintendo 3DS system in 2D. With backwards compatibility, your existing portable games look and play just as well.